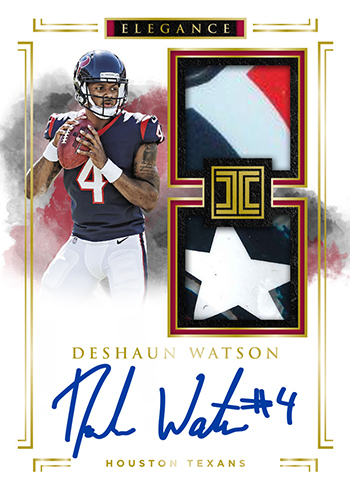 2017 Panini Impeccable Football is the follow-up to last season’s well-received brand debut. With that early success, not a lot has changed as far as overall focus goes. Premium autographs, premium memorabilia and precious metal cards garner much of the product’s attention. Each 2017 Panini Impeccable Football hobby box has five autographs. One of those is a rookie patch autograph. Like the freshman release in 2016, these aren’t all regular patch cards. Multi-swatch versions go beyond regular premium jersey pieces to also use things like helmet stickers and gloves. These cards fall under the Elegance banner. But they’re not the only ones. 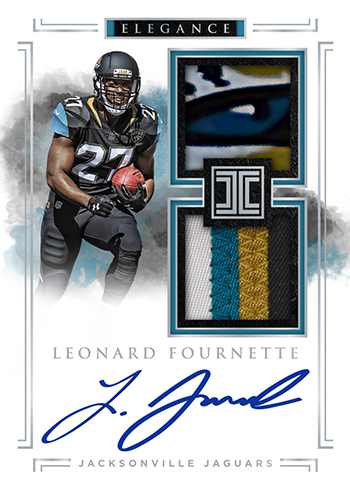 Elegance Retired Patch Autographs feature some of football’s all-time greats. Veteran Elegance cards are also available in 2017 Panini Impeccable Football. Several of the autograph themes in the product are dedicated to specific moments. These include Impeccable Draft Picks Autographs where the serial number coincides with their draft position. Other autograph inserts that take a similar approach cover such things as jersey numbers, Pro Bowl appearances, seasons in the league and various stats. Impeccable Victory Autographs highlight specific games. Dual and triple autographs are also randomly inserted along with rare cut signatures. Every three-box case of 2017 Panini Impeccable Football has a card with a piece of gold or silver embedded in it. They have a few different forms that are noted with the imprinted logo on the metal. These include the NFL Shield and Pro Football Hall of Fame. A handful of teams have dedicated sets: the Dallas Cowboys, Green Bay Packers, New England Patriots and Pittsburgh Steelers.